This article is aimed at 4×4 drivers to explain some useful techniques for driving in challenging winter conditions off the beaten track. Be sure you know what you’re driving – many SUV models are now only two wheel drive, as these are cheaper, lighter and more fuel efficient. We counted the models of a popular SUV and found that only two models of 26 were actually four wheel drive. Even Land Rover now build two wheel drive variants of popular models, so make sure you do indeed have four driven wheels! To make the most of your 4×4 you need to understand how the system works to know how to get the most from it and the various traction control systems which are available on modern vehicles. Read more about the four wheel drive system by clicking on the link below. Driving technique is especially important when driving in tough winter conditions – the natural capability of a 4×4 can be dramatically extended when it is used correctly. Ensure four wheel drive is engaged, and use low range gears (if fitted) when greater control is needed – this includes low speed manoeuvres or tricky undulating terrain. Pulling away in the highest practical gear will provide more natural traction due to the reduced torque being transmitted to the wheels. If you keep stalling when attempting to move off you’ve selected a gear which is too high. Ensure differential locks are engaged and electronic traction systems enabled to yield the best chances of pulling away successfully. There are occasions, especially when recovering a stuck vehicle, when disabling traction control systems can be beneficial, but it’s usually best to attempt recovery with the systems enabled first, only switching them off if you’ve been unsuccessful. The traction systems which can occasionally be a hindrance are the variety which have the ability to reduce engine power as a result of traction loss – occasionally you’ll need the ability to spin the wheels unhindered to provide maximum chances of recovery. Ok, so you’ve managed to pull away successfully and now you need to maintain progress. Deep snow can hide hidden obstacles such as rocks, branches and frozen pools of water. Drive at a sensible pace, but keep momentum up where possible – plan as far ahead as you can to plot a route and prepare for unexpected hazards. If you’re driving on a well established track try to stick to the centre if possible to avoid drainage ditches. If ruts have formed due to the action of previous vehicles, keep track of where your front wheels are pointing as steering feel can be dramatically reduced. It’s very common for drivers to apply a certain amount of steering lock without noticing and the car will happily continue to follow the path of the ruts – this isn’t necessarily a problem unless the wheels do eventually find traction as this could cause the vehicle to jump suddenly out of the ruts and off the track. If you absolutely need to climb hill to reach your destination, read our hill climbing tips below and remember to use the highest gear possible to give you the best chances of success. If you’re struggling to make progress you can try ‘steering for traction’ which involves rapidly turning the steering about a quarter of a turn left and right repeatedly – you’ll be surprised how effective this can be in really slippery conditions. Slides usually occur for two reasons – driver input or terrain. Keep all driver inputs as smooth and progressive as possible to make the most of available traction. If you do find yourself sliding while on the flat – you’ll probably be experiencing either understeer or oversteer. Use the articles below to understand more about these two situations. If you’re driving on a slope and start to slide downhill you’ll need to react quickly to recover the situation. Avoid driving across a slope where possible – as a rule of thumb you should tackle these obstacles either straight up or down to gain maximum control. Use the article below to learn the technique for descending slippery hills. Remember that engine braking should be used to slow down the vehicle as a preference over braking, however in icy conditions even engine braking can cause a slide. Always leave a serious amount of room to slow down, even if you have ABS fitted which will usually lengthen your stopping distance to maintain steering control – use this to your advantage to avoid hitting obstacles. Brake gently and progressively to reduce the chances of wheel lock, and remember that ABS is a reactive system so it’s best to avoid activating it at all if you can avoid it (because it means you’ve already caused at least one wheel to lock). If you don’t have ABS fitted, consider alternative braking techniques such as cadence braking. Even if you’re the best driver in the world, there will be times when nature will get the better of you and your progress hindered. The techniques below may help if you do find yourself stuck in the snow. Whatever method you choose, remember to select the highest practical gear, use the absolute minimum throttle and wiggle the steering for best results. If you’re car is now sitting on a bed of compacted snow, it can be very difficult for the wheels to find grip – clear any snow away from the underside of the car and around the wheels with a shovel. Cutting channels for the wheels to follow can also aid progress. This may seem tediously obvious, but it’s often much easier to reverse out using the tracks that your own vehicle has created than forging new ones by attempting to continue. This should usually be your first course of action. If you’re stuck in deep snow, sometimes a rhythmic rocking motion can be enough to free your vehicle – alternative between a suitable forwards gear and reverse, and attempt to start the car rocking forwards and backwards thus creating a small area of flattened snow which can be used to create sufficient run up to clear the obstacle. Sand ladders, snow chains, car mats and even cat litter can be helpful traction aids – use whatever you have at your disposal and put in front of the tyres in the desired direction of travel. Letting some air out of the tyres will increase the size of the contact patch and provide some valuable extra grip. Only use this as a last ditch attempt to get free, and if you need to get back onto the highway reduce your speed to the minimum practical speed and reinflate at the earliest opportunity. If you’re well and truly in the deep stuff, towing is usually a much quicker and easier option than winching. Use tow ropes or straps which are suitably rated for the weight of the stranded vehicle and attach to approved recovery points. Drive the recovery car until the rope is tight, then stop. 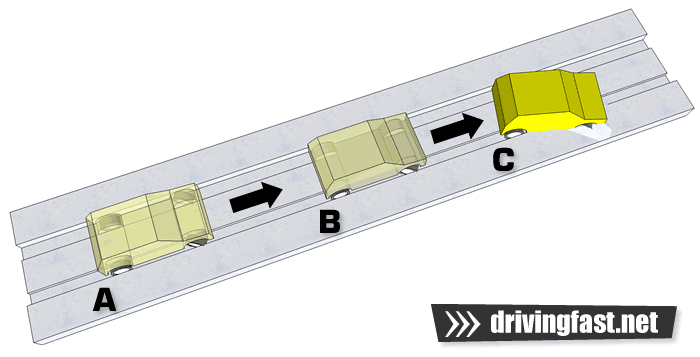 Then pull away gently while the driver of the stranded vehicle gently spins the wheels of the stuck car.